I have been busy trying to get ready for the meeting in Reno. I usually ship out my course materials in advance but it slipped my mind. I'll have to drag everything with me. Since we are going on a camping trip in California immediately after the meeting I have to get that stuff ready as well. I guess I know what I will be doing this weekend. So far I've received yarn from Miss Babs and Briar Rose for the door prizes at Masters Day. Hopefully the rest will get here before I leave. I appreciate their generosity. I know the attendees will also! I will not be making a blog entry again until September 28th. I am going to try and remember to take photos. I think there will be 10 (!!!) committee members at Masters Day. I hope to get a photo. I reviewed lots of lessons this week. I will be able to review any that arrive today and Saturday. My neighbor will take in any that arrive while I am gone. I will review them on September 12. This weeks tip is a continuation of last week's tip. 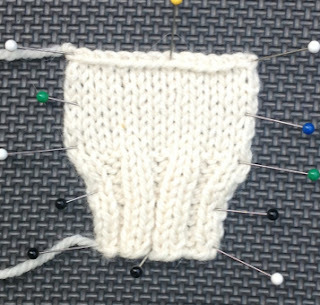 One thing that I have noticed in many of the lesson I review is that students have difficulty with blocking ribbing and cables. Compare these two photographs. These swatches have the same number of stitches and rows. The first has been stretched during the blocking process. Notice that the stockinette stitches are open and lace-like. The ribbing is no longer ribbed. It is absolutely flat. In the second photograph, the knitted fabric is not stretched. The selvedge edges are flattened and pinned and the ribbing is not stretched at all. It is smooshed into place and the edges are flattened. Selvedge stitches should not be curled under the fabric. It makes it easier to finish the edge when they are flattened. 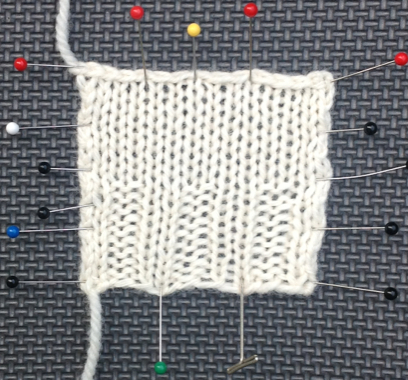 Many knitters try to solve problems with their work through blocking. 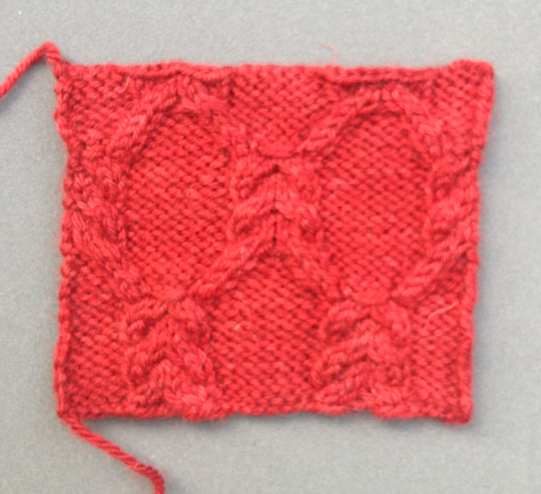 As the first swatch illustrates, yes, you can make something larger but it may not look right. Yes, you can disguise some tension problems by overblocking but they will still be visible. Blocking should enhance the fabric, not make it look worse. Lace is the one fabric type where it is almost impossible to overblock it. Stretching just opens up the yarnovers. Refer to the photos in last week's blog of the Wasp Wing lace. Cables present a different type of problem. When you are planning a cabled project, the first thing to consider is how you want the cables to look in the final project. For example, in an Aran project you do not want the cables stretched very much. 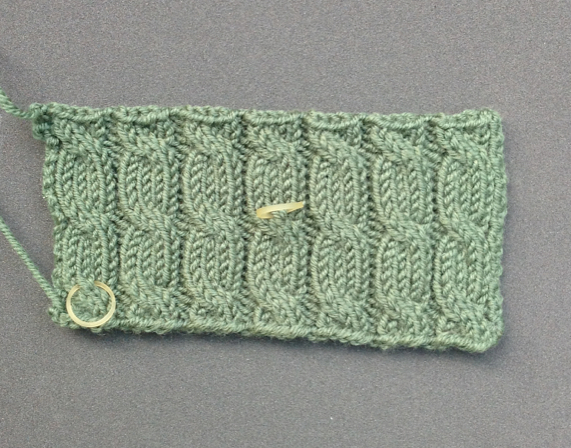 The beauty of an Aran project is the texture of the different stitch patterns. When blocking the pieces you would want to be very careful not to flatten the cables and bobbles. For other types of cable patterns, you may want to stretch the fabric a bit as in the photograph below. The swatch was blocked the way I wanted the final fabric to appear. 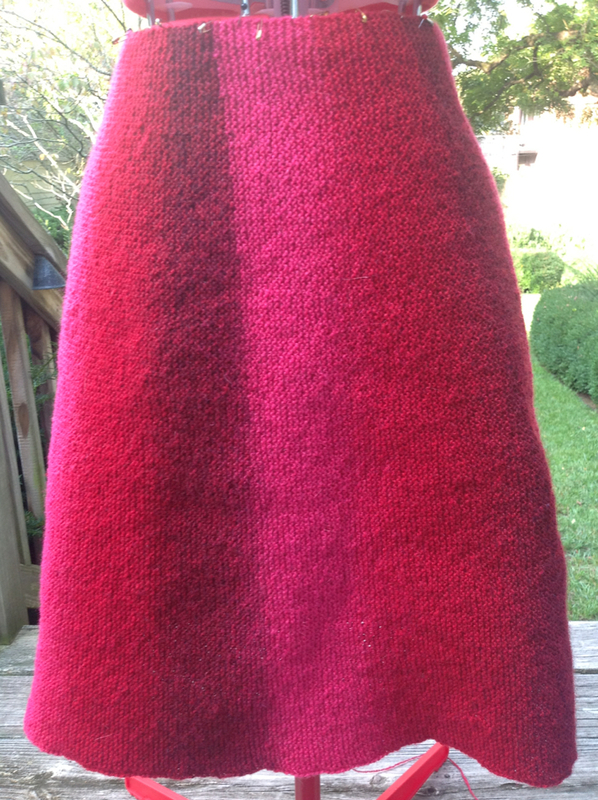 The reverse stockinette is flat but the cables are not flattened. In photograph below, the swatch hardly looks blocked at all but it is. For this project, I did not want the reverse stockinette between the cables to be very visible. By the way, those are dental elastics in the cables. I use them to mark the cable row. It makes it easier to keep your place. You cut them out of the fabric when you are finished. Sue from IN, who recently finished the Basics course and is embarking on the Masters Program came to Salon last week. It was very nice to put a face to a name (and Ravatar). We are a very informal, friendly group. We just sit and knit. If you are ever in Lexington when we are having Salon, let me know. You will be welcome. Salon this week will be on Saturday from 1-4pm. Friends have asked us to the UK game and tailgate party. I will need the extra time to get ready since it is supposed to be cold. The next Salon will be on Sunday, Sept. 23. I am so close to finishing the skirt. I've got about another inch or two. I've pinned it to the form. I really like who the yarn is working out. 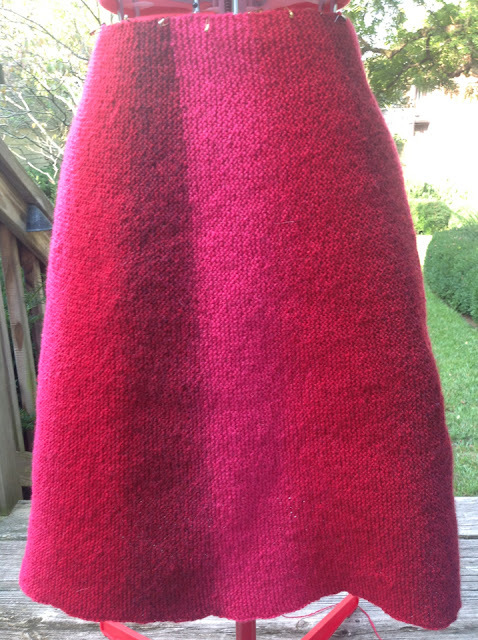 This skirt demonstrates why garter stitch needs to be blocked. It just looks a bit lumpy and bumpy. I'm not sure I will have it finished before I got to Reno. I have to graft the sides together and pick up stitches for a waist band, not to mention, finish the knitting. I am going to work on the other skirt on my trip.